……Allows Cancer Warning on Roundup. California is the first U.S. state to require Monsanto to label its blockbuster weed killer, Roundup, as a possible carcinogen, according to a ruling issued Friday by a California judge. Fresno County Superior Court Judge Kristi Kapetan previously issued a tentative ruling on Jan. 27 in Monsanto Company v. Office of Environmental Health Hazard Assessment, et al. Judge Kapetan formalized her ruling Friday against Monsanto, which will allow California to proceed with the process of listing glyphosate, the active ingredient in Roundup, as a chemical “known to the state to cause cancer” in accordance with the Safe Drinking Water and Toxic Enforcement Act of 1986, better known as Proposition 65. Read the whole story here by Robert F. Kennedy, Jr. He was on the front lines at Standing Rock too. He seems to always be standing on the right side of right. We owe him a debt of gratitude. California judge rules AGAINST Monsanto and allows cancer warning to go onto Roundup. First in the nation. The first in the nation and the rest is history. This is all it takes to start turning the whole thing around. Will never go back to unlabeling GMO’s. Good move Vermont. You did yourselves proud!!!! 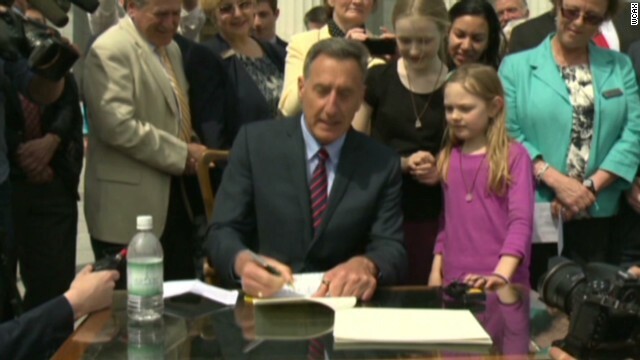 (CNN) — Vermont’s governor on Thursday signed a bill into law that will require the labeling of genetically modified foods — hailing it as the first such law in the nation. Under the new law, food offered for retail sale that is entirely or partially produced with genetic engineering must be labeled as such by July 2016. In the absence of federal action, other states have introduced similar legislation or ballot initiatives, according to the non-profit Center for Food Safety. Maine and Connecticut passed laws requiring labeling, but they won’t go into effect until other states pass GMO-labeling laws. Vermont is the first to pass a “no strings attached” bill, the watchdog group said. Supporters of the law expect it will be challenged in court. “I can make no predictions or promises about how the courts will ultimately rule but I can promise that my office will mount a vigorous and zealous defense of the law that has so much support from Vermont consumers,” said Vermont Attorney General William Sorrell. Cathleen Enright, executive vice president for food and agriculture for the Biotechnology Industry Organization, a trade group, warned that mandated labeling could make food costs for the average household could go up as much as $400 a year. She stressed foods made from genetically modified crops are as safe as any other. “And these same GM crops have enabled farmers to produce more on less land with fewer pesticide applications, less water and reduced on-farm fuel use,” Enright said in a statement. The U.S. Department of Agriculture Food Safety and Inspection Service approved a non-GMO label for meat and liquid egg products in June, the first time the department has approved such a label from a third party. GMO foods were approved for human consumption in 1995, but the Food and Drug Administration never required any labels pointing them out as such. VICTORY!!! SENATE KILLS THE MONSANTO PROTECTION ACT. “I will continue to fight for food safety and consumer information to support the health and well-being of families across America.” – Senator Barbara Mikulski. According to Murphy’s group, Food Democracy Now! has generated more than half a million signatures in a petition delivered to Congress and the White House demanding the removal of the rider. In addition, the law’s opponents logged more than 40,000 phone calls to members of congress in the last two weeks alone. This is a major victory for America’s farmers, our democracy and our food supply and would not have been possible without all of your calls and emails! Incredible thanks from all of us at Food Democracy Now! – Let’s keep the progress moving forward on GMO labeling! Starting at Mitchel Park. Walked down Marsh and up Higuera back to Mitchell. Over 200 people, kids, dogs, students, grandmas, grandpas and everybody in between. It was a good day in the neighborhood. Poly Ag students. Good for them!!!!! 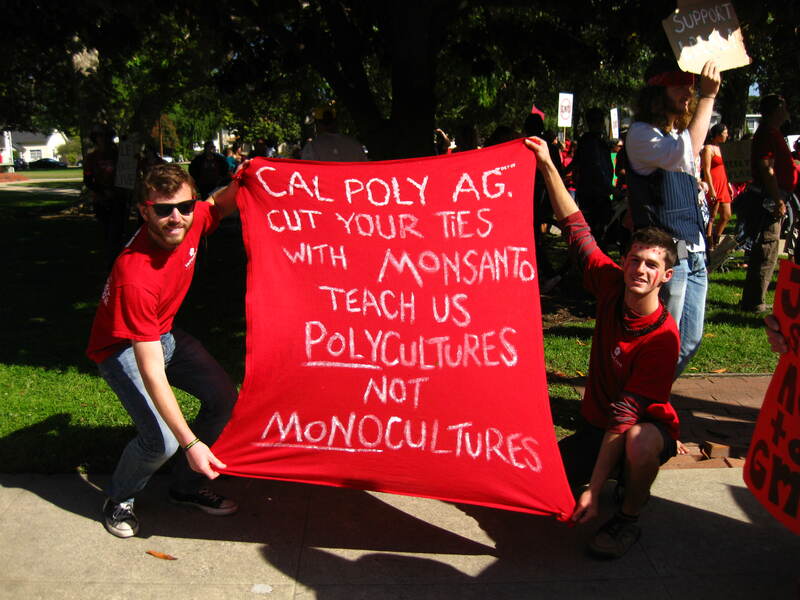 Cal Poly is a Big Time Monsanto supporter. These kids have guts. Our future is looking bright. I have waited a long long time to be able to post really good news about Monsanto. This is not the best news, that day will be when Monsanto is eradicated off the face of the earth, but it is getting there. Buying power can bring any mega corp to its knees. If we don’t buy it they have to eat it. Boycotts, protests, petitions seem to be working. (NaturalNews) Monsanto is now in full retreat against a global grassroots rejection of its poisons and lies. The company is backpedaling on every front now, even admitting defeat in Europe and now trying to focus its last, desperate efforts on the United States and Brazil. But even in the Americas, Monsanto is losing on every front: GMO labeling legislation is cropping up in over a dozen states, the global March Against Monsanto demonstrated global grassroots unity against GMOs, and even the so-called “science” behind the “safety” GMOs is revealed as utter hogwash now that GMOs have escaped Monsanto’s experimental wheat fields and contaminated commercial wheat crops in America. Japan has halted U.S. wheat imports and South Korea joined in as well. Ben & Jerry’s ice cream company has announced it is going 100% GMO-free, and massive boycotts are under way against brands that tried to block the GMO labeling ballot measure in California (Prop 37). Jeffrey Smith of www.ResponsibleTechnology.org has always talked about a “tipping point” being reached on GMOs, after which the flood of consumer awareness and demand would force food manufacturers and retailers to begin the process of ditching GMOs. I believe that tipping point has now been reached. 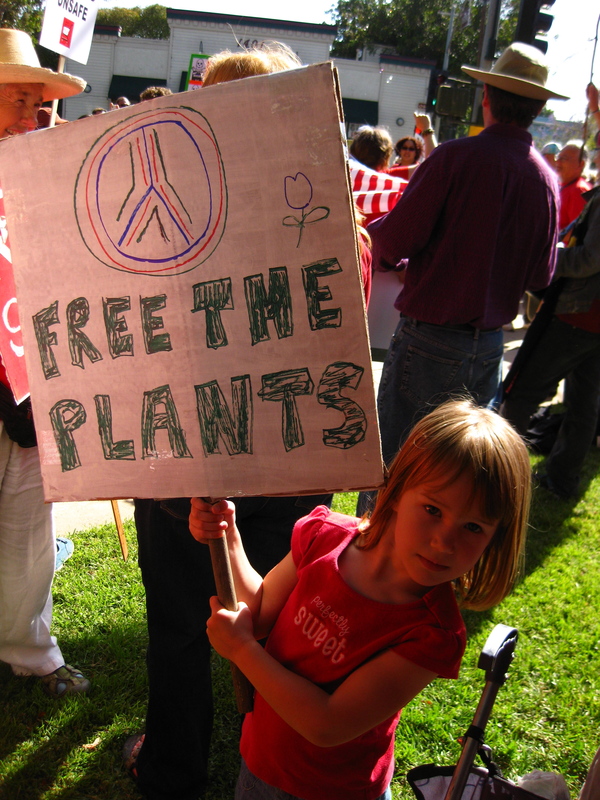 In fact, I believe the March Against Monsanto was the final push over the fulcrum of the tipping point, and I am ecstatic that so many people all around the world marched in the streets to protest global food injustice while the wholly-discredited mainstream media sat back and pretended the march never even took place! In one fell sweep, the tipping point against Monsanto was triggered and the whole world realized the mainstream media has zero credibility. I’ll call that a victory any day! Next steps: Commands from headquarters? If you’re waiting for “commands from headquarters” to figure out what’s next in the war for food justice and farming justice — the war against Monsanto and GMOs — you don’t really understand this movement. The beauty of everything that’s happening today is that there IS no headquarters! 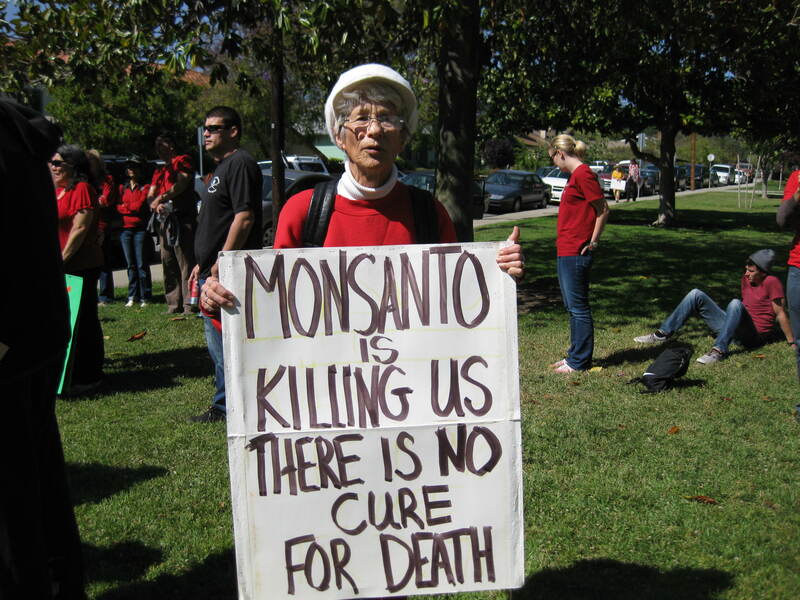 Activists against Monsanto are simply making this up as we go along. There is no “leader.” There is no secret strategy meeting. There are no talking points. There is no overarching set of milestones being discussed. There is no one person that makes all this happen. The anti-GMO movement is all just large numbers of courageous individuals waking up and doing what needs to be done, whether that’s organizing a march, posting videos online, boycotting food brands that use GMOs, or holding home viewing parties of DVDs that educate people on the truth about GMOs. This is the movement’s strength. 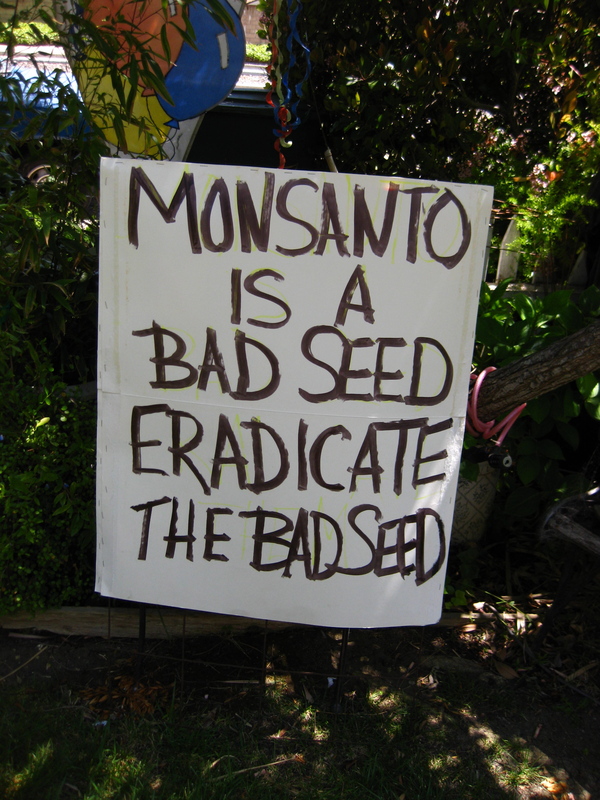 This is why nobody can be intimidated, sued or shut down by Monsanto. Behind every activist there are a thousand more carrying the torch for food justice. The anti-GMO grassroots movement absolutely will not stop until GMOs are banned from the global food supply, and that bold statement is just as true in Venezuela and Portugal as the United States. Everywhere that people eat food and grow food, everyone who is informed supports the idea of outlawing GMOs entirely. This goal will be achieved. I can see it now with clarity. The grassroots energy behind this movement is unstoppable. 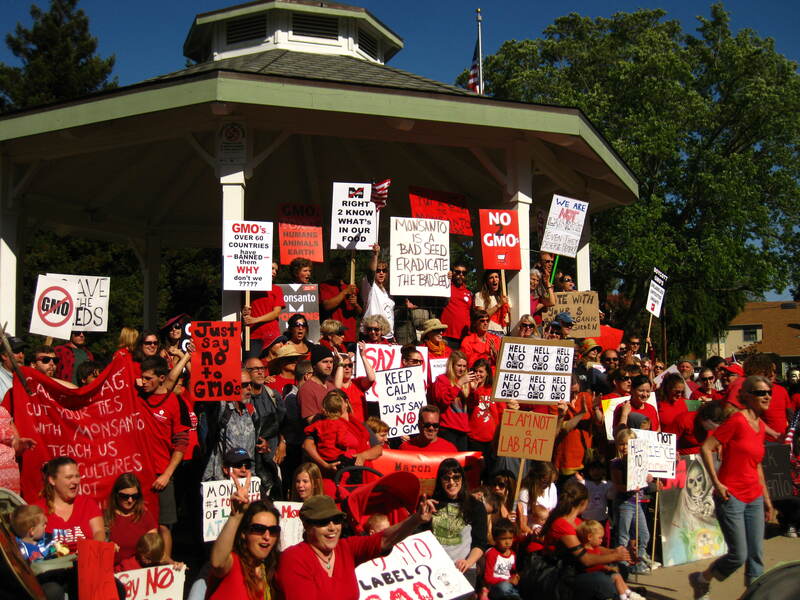 And while everyone in the grassroots anti-GMO movement may come from slightly different viewpoints on other social, political and economic issues, they all agree that GMOs have no place in the food supply, period! The fact that you are here, in all your beautiful diversity… is proof that they cannot divide us! They can only unite us with their insanity! If you are part of the effort to stop Monsanto and outlaw GMOs, you are winning. You are making a measurable, effective difference in the world, and the positive shockwaves of your efforts will be felt for generations to come. In light of the recent public anger over the Monsanto Protection Act, here’s a simple, list of companies that use Monsanto products. 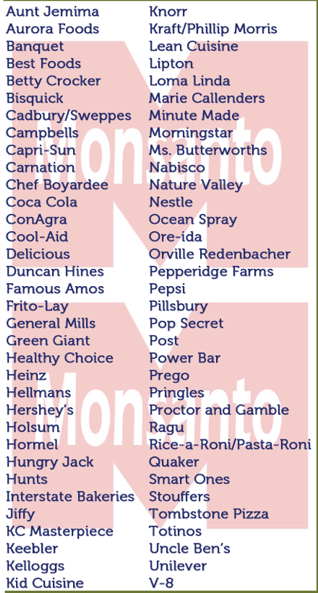 By avoiding products made by companies on this list, you can help ensure your money isn’t going to Monsanto. Monsanto wrote the Protection Act. It says you can’t sue them for anything. This is akin to the Halliburton Loophole, maybe that is where they got the idea. Here’s a list of companies to Boycott. Try this. Start with the A’s and every week add a new product you will Monsanto free in a little over a year. Well almost. Truth is there are corn derivatives are mind boggling. But lets just get rid of these nasties first. Just one little thing you could be watching out for that really surprised me that is why I am mentioning it because Trader Joe vitamins and supplements have this in it and I can’t buy them any more. Maltodextrine is corn starch, magnesium stearate and citric and ascorbic acids are used as a filler and comes from corn. O.k. I lied you have to look over this list too. Right now I am in a bind as to where to get my extra Vitamin C. Can’t seem to be able to avoid the magnesium stearate or ascorbic acid compounds. Below is a website written by someone who has a corn Allergy so she knows her stuff mainly because she finds out it has corn when she has a reaction. With 90% of all the corn being GMO chances are these things are GMO corn derivatives. And Vit E. Darn! I am proud to say I no longer buy anything on this list. Above list that’s a different story. Inch by inch……..
And you have to think about what ingredients restaurants use. Again, unless they advertise otherwise more than likely they are buying cheap and it has GMO’s in it. Recount of Prop 37 Stopped COLD. Why? If something doesn’t feel quite right it usually sends up a little red flag and gives cause to pause. So, is the case with the defeat of Prop 37, Label GMO’s. Something was not adding up. With 90% of the people polled wanting GMO’s labelled how is it that the initiative lost with only 48.5% of the people voting for it? A small group, headed by Tom Courbat, former senior budget analyst for LA County, was wondering the same thing and decided to challenge the vote. Any public citizens can ask for a recount but they have to pay for it. 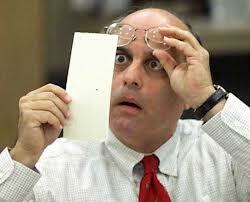 Here is how that recount inquiry went down. It explains a lot and tells you that when something just doesn’t feel right chances are that feeling is right. Forget Denmark, something is very rotten in our own backyard.